"...Twenty years ago in France, I first encountered the unforgettable tang of goat cheese. Now New York shops are selling it..."
Among the galaxies of cheese, perfect circles of Brie have long been the luminaries, but Capricorne is coming into view. The future for the sign of the goat is favorable. French goat cheeses are the bright new stars. I first encountered the unforgettable sharp tang of fromage de chèvre some twenty years ago in France. It was a shot in the taste buds. At Androuet, on rue d'Amsterdam in Paris, I was able to sample a few dozen of the countless varieties produced. Back in New York, I found the selection of fromage de chèvre consistently disappointing. Then, about five years ago, good French goat cheeses began showing up in cheese shops with increasing frequency. Today, even the most limited inventory is likely to include a log or two of chèvre. Is fromage de chèvre popular simply because there's a sudden cheese craze on in New York? "No, it's more than that," says Eddie Edelman of Ideal Cheese, 1205 Second Avenue, nibbling a crumb of delectable Ste. Maure. "I think the travelers to Greece and the Near East, where cheeses are made with goat's and sheep's milk, have acquired a taste for it. Now it's considered sophisticated, and it's very popular." Several cheese dealers concur, although a salesman at Balducci's in the Village thinks the craze for chèvre is limited to the Upper East Side "caviar belt," and Bloomingdale's has not been able to detect a goat-cheese trend. French goat cheeses vary from tiny, hard disks (crottin-"dung") and pyramids to five-pound logs and blocks. They are usually white as snow, with a soft texture that may be creamy and moist or dry and crumbly. Some varieties develop a rich surface creaminess as they ripen while still retaining the characteristic chalky white core. 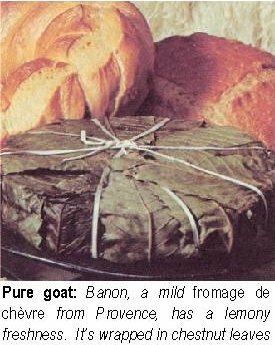 The latest imports include wheels that develop like Brie or Camembert, combining a fluent, satin texture with the typical tang of goat. Several types of goat cheese are dusted with edible vegetable ash, which imparts a slightly sharper flavor in addition to keeping the cheese more moist. Others are coated with paprika or an natto, which, tints them orange. These rindless, coated cheeses tend to remain chalky through and through. Every region of France has its own goat's-milk cheeses. Chances are that we'll never see most of them here. Production is extremely limited. There is simply far less goat's milk than cow's milk available. Add to this the fact that goats do not respond well to mechanized dairying, and you can understand why goat's-milk cheeses are at the high end of any price list. I found close to 30 different French goat cheeses in the major cheese shops around town. They may be in individual packages of about ten ounces, or sold by the pound. In order to be labeled "pur chèvre," the cheese must be 100 percent goat. Goat cheeses labeled 11 "part skim" have been made from a combination of cow's and goat's milk. 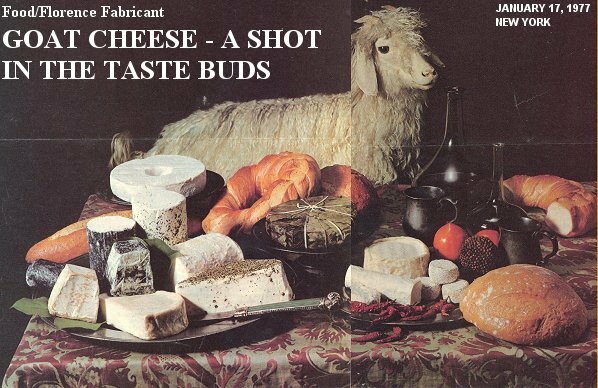 To the connoisseur of chèvre, these taste less distinctive. Lezay and St. Saviol are two of the major French cooperative creameries producing goat cheeses for export. In general, the Lezay cheeses are milder than St. Saviol varieties. The cheeses of another cooperative, Europ-Lait, are now being distributed nationwide. Its goat cheeses are labeled "Le Bougon." Goat cheese keeps fairly well under refrigeration. It is impossible to generalize, because much depends on the condition of the cheese when purchased. Let your nose be your guide. When the cheese becomes pungent or rank, it's over the hill. Fromage de chèvre should be brought to room temperature before serving. It's excellent with cocktails, salad, or fruit, guaranteed to revive somnolent palates. It has less butterfat than cheese made from cow's milk, its softer curd is easier to digest, and its flavor is splendid. You will find the best selection of goat cheeses at Ideal Cheese, 1205 Second Avenue near 63rd Street; Zabar's, 2245 Broadway at 80th Street; Cheeses of All Nations, 153 Chambers Street; Cheese Unlimited, 1529 Second Avenue at 79th Street; and E.A.T., 1064 Madison Avenue at 80th Street. Prices are lowest at Cheeses of All Nations-they average $3.98 a pound. At Ideal Cheese, Zabar's, and Cheese Unlimited, prices are moderate--$4.50 to $6 per pound. Eli Zabar, who owns E.A.T., told me he carries the broadest selection of goat cheese and that he has introduced more people to it than has anyone else in the country. If you think these claims are exaggerated, you should see his prices--they run $7.95 a pound and up. At Cheeses of All Nations and Cheese Unlimited, you may be told that a cheese is "goat" when it is made from a mixture of goat's and cow's milk. Ask to see a label, especially if the cheese is at all yellowish. The following stores carry up to ten types of chèvre at moderate prices: Balducci's, 424 Sixth Avenue near 9th Street; Cheese Village, 3 Greenwich Avenue; HOZ Cheese Pantry, 1270 Madison Avenue at 91st Street, and 1034 Lexington Avenue at 74th Street; and Macy's Herald Square. You will find a comparable selection, but higher prices, at Bloomingdale's and Cheese East, 1064 First Avenue at 58th. When you ask for goat cheese at some shops (Merit Farms, for example), they will assume you mean the slightly sweet cooked goat cheese called Gjetost, or "Ski Queen," the Norwegian national cheese. It looks like brown laundry soap and is definitely an acquired taste. Several varieties unavailable for our portrait (top of page) include very perishable Chabichou, St. Marcellin (often confused with Baron), and Le Sauzé, a small St. Saviol log. 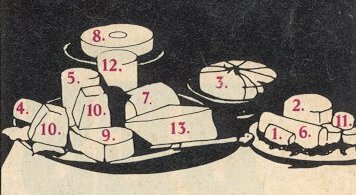 Below, some of the fromages de chèvre available in New York City, starting with the mildest. 1. Capricette: Very mild, creamy, and spreadable. Pure goat. 2. Chevrotin, Chevreton: One-and-a-half-pound cylinder, mild but un- interesting. Pure goat. 4. Montrachet: Ten-ounce log, pleasantly tart and salty, comes either white or coated with ashes (slightly sharper). A creamier version is sold in cups. Pure goat. 5. Lezay logs: Large logs or trape-zoidal loaves; may be all white or have an orange or ash coating. They are typically firm, chalky, and pleasantly tangy. Pure goat. 6. Ste. Maure: A small log, six to ten ounces. It is one of the most popular goat cheeses in France. Develops a surface creaminess as it ripens. Pure goat. 7. St. Saviol, Bucheron: Large logs with a light rind, chalky center, creamy edges, and a tangy but rich goat flavor. Pure goat. 8. Capricorne: A wheel with a hole in the middle. It's moderately sharp and salty, but very fresh. Except for surface mellowing, the texture is fairly dry. Pure goat. 9. Géant du Poitou: Medium-sized wheels that ripen and run like Brie. The cheese has a sharp, goaty tang. Pure goat. 10. Pyramide: Pyramid shape, available white or coated with ashes. Very assertive. Pure goat. 11. Crottin de Chavignol: Small, hard, sharp-tasting disks. For the educated palate. Pure goat. Nos, 12 and 13 are flavored with herbs, pepper, and olives. Dealers thought these appealed to the novice rather than the experienced eater of goat cheese. 12. La Chevrette: Available in six-ounce logs or large logs sold by the pound in plain, herb, pepper, and olive. They are not pure goat, and the texture is smooth but not fluent. The salty olive or the sharp pepper is fairly good, but to me ,the herb tasted somewhat sour. 13. Royal Provence: Of the two flavored goat cheeses, I prefer this one in the olive or pepper variety. For one thing, it's prettier, the outside of the wheel studded with olives or crushed pepper. The rich, salty olive or the snappy pepper is delicious with cocktails. Not pure goat.